There is a technique to crossing Kansas, get up early and hope you get a tail wind, then cover as many miles as possible! Not very scientific I know, but with temperatures around 100 degrees, Tornado warnings, winds that can give you a 100 mile day or a 40 mile day, depending on their direction and this year as an added attraction, unprecedented flooding, your guaranteed an interesting ride! 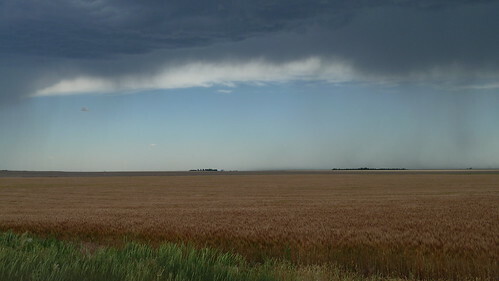 Kansas has a beauty all of it’s own, it’s a vast expanse of flatness broken into a grid system of roads running North, South, East and West, some gravel, some tarmac. Each of the grid squares seem to have either corn, wheat or cattle in them. That is of course a very simplified description but it gives you an idea of what this State is like. Have a look at the Google Earth screen grab below and you’ll see what I mean. We’ve been following pretty much an East West route across the state with a large part of it on Highway 96. 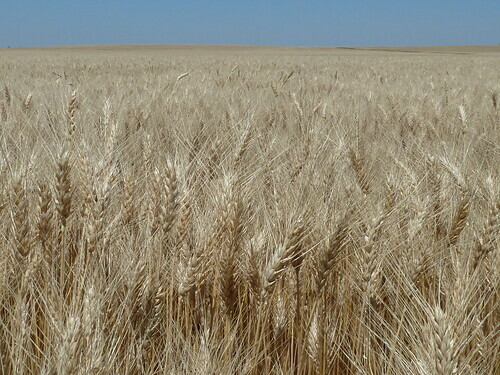 With the wheat harvest about to start we have crossed the Prairie just in time, as traffic will increase massively over the coming weeks, with huge trucks hauling combine harvesters to the next area that needs harvesting. So It’s all hands on deck for the prairie community, every diner, bar and gas station we’ve been in is buzzing with harvest talk; even the kids get involved with teenagers driving long shifts in fleets of combines. 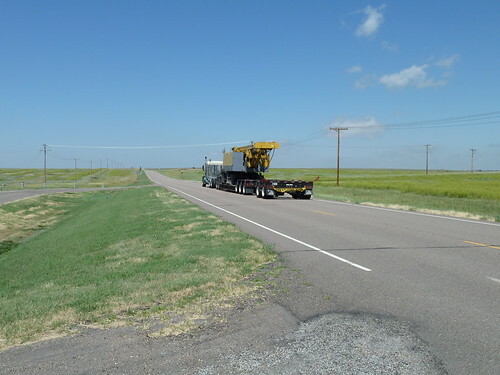 We have already experienced many escorted wide loads hauling farm machinery and silo’s looking like sections of moon rocket. They give us little room and bailing out onto the verge is sometimes the only option. A huge MAC truck bearing down on you from behind sounds like a Tie Fighter attacking and is probably as scary, luckily the force has been strong with us; although Keith did get hit by a car and is now carrying it’s broken wing mirror as a memento! As usual we have met some great people on our journey, one in particular springs to mind. 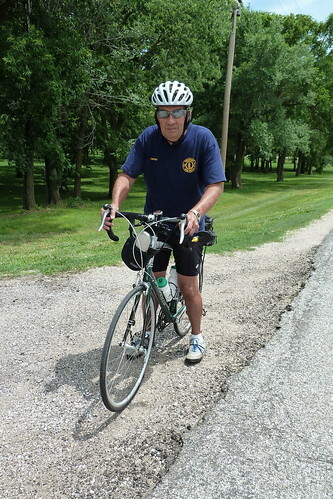 Don the retired 75 year old Wichita Fire Captain, who we met out on NE Flinthills Road as we headed towards Cassoday. He was coming towards us at a fare speed and circled in the road to join us, after brief introductions he told us he was out on his favourite day ride but had done the western part of the trans am on a tandem with his wife some years ago. His wrap around shades, crash helmet, cycling shorts and muscular physique hid from us an elderly gent suffering from Parkinsons for three years. He told us he was fully aware of what the disease had in store for him, but was determined to carry on cycling in order to fight the disease and the side effects it brings. He kept at our pace and chatted away about cycling and his time in the Fire Service and the Forces, as we got near Cassoday he invited us to join him for lunch at the Cassoday Country Store eat all you want homemade buffet. As we entered the store the locals immediately started bantering with him and we could tell he was well respected and well known. Lunch went down a storm, home fried chicken (forget KFC! ), mash and many other sides, but the dessert took the crown, Rhubarb Cobbler with home made ice cream out of an iced barrel. Don told us tales of the Trans Am, including the eye watering story of how he almost had to give up in the Rockies as a haemorrhoid meant he couldn’t sit on his bike seat. He explained how he remedied this with a DIY amputation using a razor blade. I whinced as I tucked into the last mouthful of my cobbler; this man was a Kansas cycling hero that we had had the pleasure of riding and lunching with. A really inspirational guy battling with a terrible disease. Other characters we met on this leg of the journey included Bev and Chuck who run the Peace Creek Hostel near the Quivira National Wildlife Refuge, west of Nickerson KS. They open their doors to cyclists, cook you a meal, let you use their facilities and pitch your tent in their front garden, purely for a voluntary contribution. Getting to the hostel, 5 miles off route at the end of an wind blown 85 mile day was a challenge. Being the only house for miles and tucked away down a track, I ended up using Indian style tracking techniques to find tyre prints of the faster cyclists ahead. Passing through a wildlife reserve also bought with it beauty and danger, birds of prey circled above and deer wandered across the road in front of me as I battled immense head winds moving at only five miles an hour. At one point a large snake slid between my wheels, the resulting dismount from my bike would have won Olympic gymnastic gold and put Olga Korbut out of medal contention. I unclipped both feet simultaneously, pushed on the bars and lifted myself in to the air turning 180 degrees in the process and still holding onto my bike at arms length as it ground to a halt. I hadn’t seen where the snake had gone so I carefully examined my rear panniers to ensure it wasn’t hiding in my luggage! I eventually made it to the hostel and caught up with the other guys. I also saw my first cowboy in Kansas, rounding up cattle, wearing a Stetson, spurs and carrying a lasso, it was a real time warp image, one that captivated me so much I forgot to get a photo! My scariest moment in Kansas was captured on video as part of my previous Blog. Cycling towards Tribune I watched a storm start to develop and the more it grew and the stranger the clouds appeared the more I thought I was about to see a Twister emerge. A few miles out from town whilst filming the storm two locals stopped and offered to turn round and drop me into town. I decided to ride it, determined nothing would stop me riding all the way across America, those last few miles were the fastest of my trip so far and I was glad of the cover the Gas Station offered as a storm of biblical proportions rolled in for the night! There was a sad end to our Kansas leg when Maarten and Kees, our Dutch cycling companions caught up with us, but unfortunately they were in a hire car. Kees had suffered bad dehydration and had been on a drip in hospital, they tried to carry on but he was to ill. After much deliberation they decide to finish their US trip by car and see some of the sites, before flying home from San Francisco. I’m totally gutted for both of them, a great father and son team who were an absolute pleasure to cycle with and great proponents of sarcastic wit, something I’m slowly training Tony in! Kansas was generous to us on our last morning in the state, almost a Mickey take, in that it showed us what difference a strong tail wind can make and blew us at speed into Colorado! Great post! The story of the guy from the Fire Service was quite something. Wow, the courage of that guy!! We met Don in the exact same fashion and ate at cassody's. Except it was pizza buffet day! He got me really excited about Wyoming and Montana, what a guy.